Revista Cientifica / Revista quincenal del Espiritismo. Madrid, Spain. Language: Spanish. Publisher: Alcantara; Impresa de Viuda e Hijos de Alcantara. 1/1, January 1868-October 1868 as El Criterio, then as El Criterio Espiritista, November 1868-1891. Not published in 1870 and part of 1871. 16-20 pp., 60 reals a year. This was the first spiritualist journal in Spain. Its originator, Pastor y Bedoya, was a devoted Kardecist and tireless propagandist. He and the Madrid Sociedad Espiritista Espanola he founded in 1865 first tried to publish the journal in mid-1867. Oscar M. Garcia Rodriguez, "Hemerografia Espiritista Espanola, 1857-1936," https://grupoespiritaisladelapalma.wordpress.com, has found a newspaper notice from July 9, 1867 announcing that the journal (then called El Criterio Espiritista, a weekly) would begin publishing the next day. Apparently one issue was published before the authorities prohibited further publication. Not to be thwarted, from January through October 1868 the journal was published as El Criterio: Revista Cientifica, without explicit reference to spiritualism. In November, after the Spanish "Glorious Revolution" of September, Pastor y Bedoya added the adjective "Espiritista" and the new subtitle "Revista quincenal del Espiritismo." See "Bibliographie: El criterio espiritista, Revista quincenal del espiritismo," Revue Spirite 11/12 (December 1868): 394-96. Like all nineteenth century Spanish journals devoted to the spirits, Criterio was firmly Kardecist, with a note from Allan Kardec in the first issue, and "liberal"-part of the wave of reform, socialism, masonry, freethought, feminism, republicanism,and secularism that animated the Spanish educated classes until the Civil War of the 1930s. One of the first issues presented a letter on the virtues of Charles Fourier's utopian system, and another presented the account by a recent Garibaldian spirit of the battle of Mentana. In 1871 the journal absorbed El Progreso Espiritista of Saragossa after that journal's founder, Antonio Torres-Solanot y Casas and his Grupo Marietta transferred their activities to Madrid. Torres y Solanot succeeded Pastor y Bedoya as director of the journal in 1873, but the more phenomenal spiritualism espoused by him and his group created stresses within the combined organization. In 1878 there was a schism over phenomena (the precipitation of hundreds of fresh flowers) produced by Amelia, a medium in Torres-Solanot y Casas's Grupo Marietta, named after one of its principal spirits. Torres-Solanot tried to dissolve the original Sociedad Espiritista Espanola, without effect, and eventually left to start El Spiritista (Madrid and Saragossa) which claimed to be the continuation of the Criterio Espiritista even though the Criterio continued to exist. There even appear to have been two issues published by the dissident group under the name Criterio Espiritista. Torres-Solanot y Casas clearly aligned himself with the more phenomenalistic side of spiritualism, publishing in 1877 La Médium de las Flores on the medium Amelia's production of flowers before the Grupo Marietta, and Controversia Espiritista a Proposito de los Hermanos Davenport: Defensa del Espiritismo con Noticias y Testimonios que Demuestran la Realidad de los Fenomenos Espiritistas, in 1875, a defense of the reality of the Davenport Brothers' productions. A Spanish psychical researcher reported that Torres-Solanot paid the flower medium Amelia and her daughter thousands of pesetas. El Criterio Espiritista itself continued under the direction of Manuel Sanz Benito (1860-1911), changing its subtitle in 1880 to Revista Mensual de Estudios Psicologicos y de Magnetismo. It participated in the International Spiritualist Congress in Paris in 1889 (and sent a delegate to the Congress of Freethinkers held there at the same time), and was continued by La Fraternidad Universal beginning in January 1892. 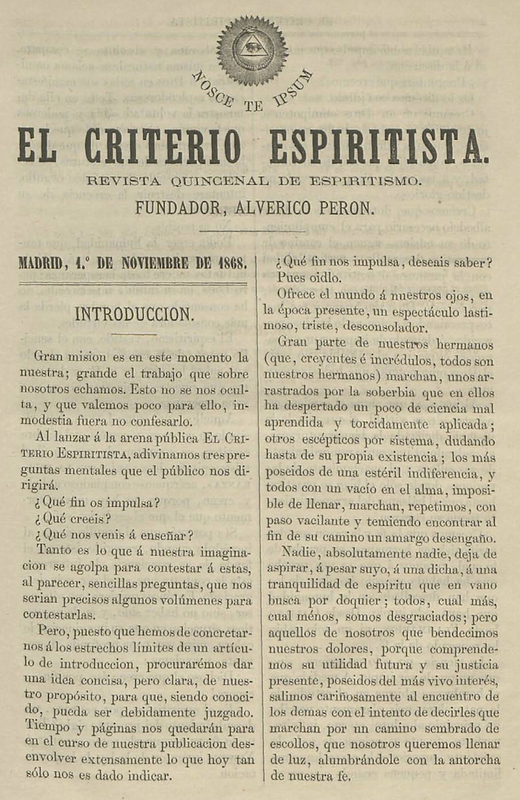 In 1873-1875 Peron's group published the companion Almanaque El Criterio Espiritista. The issue of January 1888 gave space to the hypnotic demonstrations of "Dr. Das" (Alberto de Sarak), on whom see the note under The Radiant Centre. On the journal, see Oscar M. Garcia Rodriguez, Historia del Periodismo Espiritista en Espana; De Kardec Hasta la Guerra Civil Espanola (2006), online at http://www.ameporto.org/pt/entrevistas/oscar.pdf, and Rodriguez, "Hemerografia Espiritista Espaola, 1857-1936," https://grupoespiritaisladelapalma.wordpress.com. Biblioteca Nacional de Espana; Archivo General de la Guerra Civil Espanola.